Hi friends, today we will learn how to know your house number (ଘର ନମ୍ବର) online in Odisha? If you do not have the house number plate on your home wall and need to know how to get the house number online, then here is the right place to get the house number online with easy procedure and here is the example of Odisha state. So if you are belongs to Odisha and need know the House Number then please follow the below procedure to get the house number or home number or census home number for Odisha State. House Number Odisha, India to know the house number you need to have the Voter ID card number and visit the below website and then follow the below procedure to get the house number instant on your screen. The website is completely safe as the website is Chief Electoral Officer, Odisha official website. What you need to do is, just enter the Voter ID Number and then get the house number of yours. 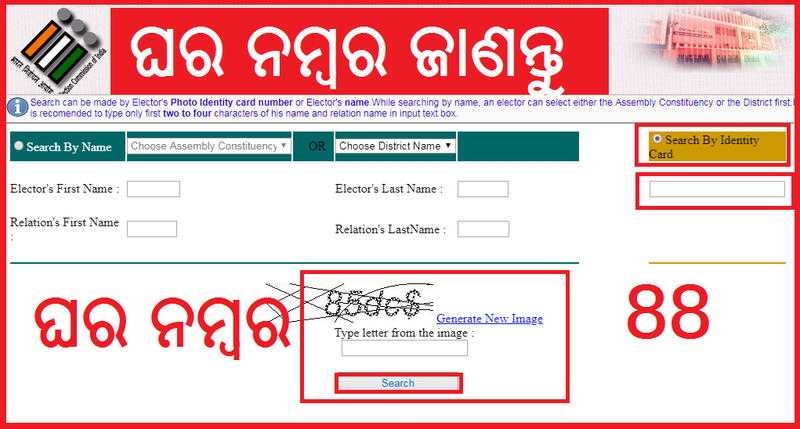 Visit the above website and then click on SEARCH YOUR NAME IN THE VOTER LIST, then select SEARCH BY IDENTITY CARD then type the captcha letter and finally click on SEARCH. Now you will get the house number of your home along with other electoral information. House numbering is a system of giving an unique number to each building or house in a street or area. for more information you can visit Wikipedia page by visiting the link https://en.wikipedia.org/wiki/House_numbering. How to check or know your House Number? Then click on "Search your name in the voter list"
Now select "Search by identity card"
Then enter the captcha letters and then press Search. That's all now you will get the Hose number of your building or home. ତା ପରେ "Search your name in the voter list" ଉପରେ କ୍ଲିକ କରନ୍ତୁ. ତାପରେ "Search by identity card" ସିଲେକ୍ଟ କରନ୍ତୁ. ତାପରେ ଭୋଟର ID ନମ୍ବର ଏନ୍ଟର କରନ୍ତୁ. How to get House Number Without Voter ID? Then enter Elector's details means for example enter your details such as Your first Name and Last name with Relation's first name and last name. Then enter the captcha letter and click on search. You can also visit the http://www.ceoorissa.nic.in/FindYourName.html page and enter the voter Id number to get the Electoral details with your house number.